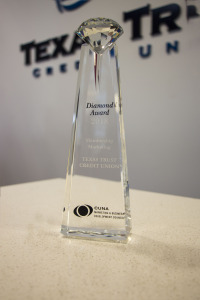 ARLINGTON, Texas — March 19, 2018 —Texas Trust Credit Union won a Diamond Award from the Credit Union National Association (CUNA) Marketing & Business Development Council. Diamond awards recognize outstanding marketing achievements in the credit union industry. 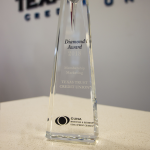 Texas Trust won a Diamond award in the Membership Marketing category for its lineup of checking accounts brochures launched last summer. The new brochures were designed with the membership of Texas Trust in mind and feature the financial benefits that fit their banking needs. The award was presented at the council’s 25th annual conference in San Francisco. Shelley Carlson from Texas Trust Credit Union attended and accepted the award from CUNA. The council includes more than 1,300 credit union and marketing and business development professionals. Awards are given in 35 categories ranging from advertising to community events and beyond. For a complete list of Diamond award winners visit cunacouncils.org/awards. Texas Trust Credit Union was created in 1936 when a group of Chance Vought Aircraft Corporation employees pooled their savings so they could help each other achieve financial goals. Today, more than 114,000 members are served through checking and savings accounts; loans (personal, mortgage, auto, and small business); credit cards; insurance products; and investment services. Texas Trust Credit Union supports local students through its “Spirit Debit Rewards” program. With every eligible swipe of an SDR card, funds are donated to the school or district of the member’s choosing. To date, Texas Trust has donated more than $1.5 million since August 2011. Texas Trust serves members through 22 locations in Dallas, Denton, Tarrant, Henderson, Ellis, Johnson and Tom Green counties. With assets of more than $1.2 billion, Texas Trust is one of the largest credit unions in North Texas and the 17th largest in Texas. For more information, visit TexasTrustCU.org or follow us on facebook.com/texastrustcu or Twitter at @texastrustcu. 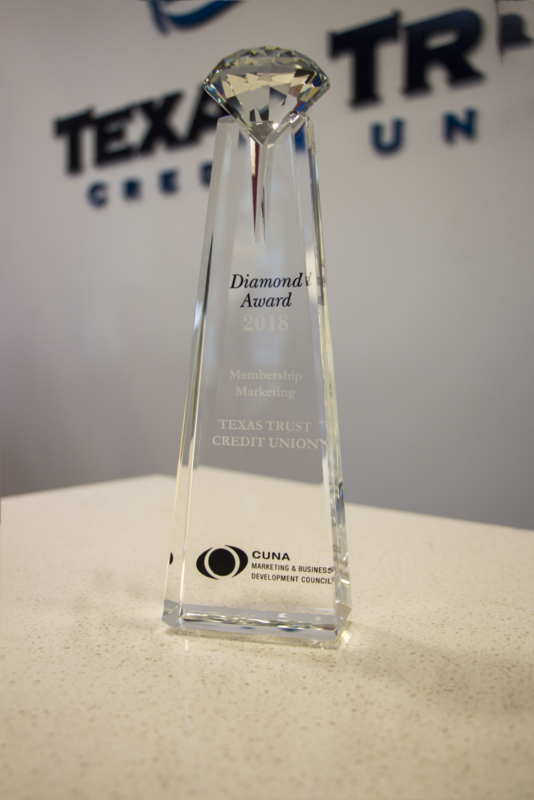 Texas Trust Credit Union wins Diamond Award from the Credit Union National Association (CUNA) Marketing & Business Development Council.